September 30, 2012 - Cessna Aircraft Company, in conjunction with Innotech-Execaire, Cessna's authorized sales representative in Canada, announced an agreement with AirSprint Private Aviation, based in Calgary, Alberta, for a minimum of nine Citation CJ2+ aircraft. At a current retail price of $6.695 million per unit, this agreement represents a total retail value of approximately $60.255 million. The addition of the CJ2+ is positioned to support AirSprint's focus on boutique customer service and regional private air travel. "The CJ2+ is a the right blend of efficiency, performance, comfort and reliability to fulfill AirSprint's mission of providing a flying experience for their clients that is exceptionally safe and convenient for both work and leisure," said John Young, Cessna vice president of regional sales. "Of all the business jets purchased by the fractional/charter industry, nearly half are Cessna aircraft." AirSprint is the largest fractional provider in Canada and has been in operation since 1999. They will use their CJ2+ aircraft to grow their fractional services in North America. The CJ2+ aircraft will replace AirSprint's current Pilatus PC12 turboprop aircraft during the next 24-30 months. "Our clients are very pleased with the balance of range, speed and efficiency that the CJ2+ offers as an alternative to our current fleet of Pilatus PC12 turboprop aircraft," said Chris Richer, President of AirSprint. "Our clients are innovators, company builders, philanthropists and leaders in the local and global community the CJ2+ will aid them in making those endeavors a great success. We are continuing to focus on safety, personalized customer service and making this transition in partnership with our clients. AirSprint's experience with Cessna and Innotech-Execaire in the operation of seven Citation Excel/XLS mid-size jets gave us great confidence that we have the backing of a strong manufacturer." 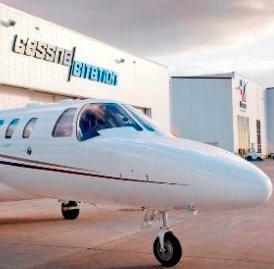 The Citation CJ2+ is part of the Cessna Citation family of business jets. More than 6,300 Citations have been delivered making it the largest fleet of business jets in the world. The CJ2+ holds six passengers in the main cabin and has a 1,600-nautical mile range and a top speed of 418 knots. It is powered by two Williams FJ44-3A powerplants, each generating 2,490 pounds of thrust.